Home / Blog / What is the best time to walk the Via Francigena? While awareness of the Via Francigena is increasing, the Camino to Rome doesn’t attract as many pilgrims as the Camino de Santiago. 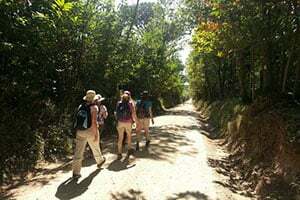 It is estimated between 2,000 and 3,000 people walk or cycle sections of the Via Francigena each year (compared to the over 200,000 receiving Compostela certificates in Santiago in 2014). 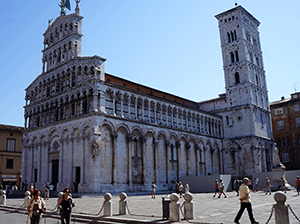 Certain sections such as Tuscany and the regions closer to Rome will be the most popular and where you will be more likely to encounter fellow pilgrims. From a social aspect Spring to Autumn is the best time to travel, as you will be more likely to encounter other walkers and cyclists along the way. While most of the sections will be suitable to walk in the Winter (apart from the mountain regions) it will be a more solitary experience and some hotels and guest houses particularly in rural areas might be close so additional transfers might be needed (always check with our team). Summer is perfect for the Northern sections of the Via Francigena, as you will benefit from longer and sunnier days; as well as warmer temperatures. This includes section 1 from Canterbury; and the Via Francigena in France in general. Summer (July and August) is also the best time to walk the Via Francigena from Lausanne to Aosta, across the Alps, as the St Bernard’s Pass will have snow most part of the year. This will also be the best time to travel most of the St Francis Way, the Cammino di Francesco, across the Apennine Mountains. Tuscany (from Lucca from Siena) is one of the favourite sections of the Via Francigena but Spring and Autumn months are better if you want to avoid the Summer heat of July and August (*If you’d like to catch the famous Palio di Siena, you will have to travel in July or August however). In September / October, you will enjoy pleasant temperatures and might also be able to catch the regional wine harvest in full swing. For more information about cycling or walking the Via Francigena, the Camino to Rome, or to book your trip, contact our travel specialists. Hi Eugene, thank you for your enquiry. One of our travel team has responded to you directly to give you some advice about this. We hope that you get the chance to experience the trail. Have a lovely weekend. Kindest regards, Lisa from CaminoWays.com. Hello, I am an Australian planning on walking the Via Francigena from Canterbury to Rome commencing in May 2018. I am a seasoned walker having done 3 Caminos in France, Spain and Portugal. I have booked my flight, have taken out travel insurance and have sufficient funds to support myself for this period. My problem is obtaining a temporary long-stay visa. I have exhausted all avenues. The French Consul in Australia, although extremely helpful, have said that I can only stay in the Shengen zone for a period of 90 days every 180 days. As an Australian passport holder I do not need a Shengen visa but I am still limited to the 90 day limit. Are you able to offer any advice or suggestions in obtaining a temporary long-stay visa? Hi Angie, where are you planning to start? Starting in August should be fine to cross the Alps and then continue across Italy in September, weather wise. If you click on the ‘weather’ tab here: https://caminoways.com/ways/camino-to-rome-via-francigena/via-francigena-canterbury-rome-full-walk you can see the average temperature/rain fall per month for each of the stages to give you an idea. You will be still getting mid-20s in Italy in September. From St Bernard’s Pass to Rome should be appoximately 47 days so if you start end of August, you should be reaching Rome in early October. Let us know if you need any assistance, quote or further advice. Kindest regards. Hi. I’m planning to walk from The Alps to Rome. I was thinking of starting at the end of August. I don’t know how long it typically takes to get through The Alps, but I am hoping that I’ll end up in Northern Italy in September, and continue on to Rome. Does this timing seem okay weather-wise? I know it’s very hot in Italy during summer, but is September tolerable? I can’t figure out a better time to combine the mountains and the other regions, since the weather will be so different. I’d appreciate any advice you can give. Thank you!